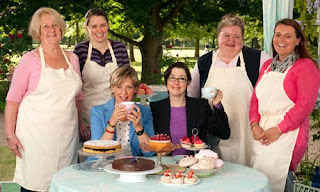 Last night was the final of The Great British Bake Off. It was a brilliant episode to wrap it all up, but I personally was a little disappointed with the result. The winner turned out to be Jo. I'm a bit gutted because I was really rooting for Holly. I thought that Jo's Millefeulles were really messy compared to Holly and Mary-Ann's although I can't say I wouldn't have eaten one if had the chance! I shouldn't be too harsh on Jo as her selection for the street party was probably my favourite of the three, but I thought Holly was so much more talented and by far the most imaginative, did you see her umbrella as a cake display?! What I can say on the final is that I felt so bad for Mary-Ann, throughout the whole competition she pushed the boat with some of her ideas, but they all fell through last night and part of me really wanted her to succeed. What I was glad to see was what all the contestants are doing now and I must admit I had a little giggle at a few, but i was so happy to see that Jo was possibly setting up her own Patisserie! What I loved more was that Holly might be in the process of getting a book made, I will definitely be keeping a beady eye out in work for that one! I've just got one problem, what am I going to watch on a Tuesday night now?